Inkjet technology is an important part of IWCO Direct’s advanced production platform. It allows us to design, create and customize highly personalized direct mail campaigns for our clients, so we make a point of attending the annual Inkjet Summit to keep up-to-date with the latest tech, products and conversations that impact the industry. A market segment breakout session led by Barb Pellow of InfoTrends titled, “The Direct Mail Market Segment Overview: Perspectives & Evolution.” Barb focused her presentation on ways to combine digital print and marketing data to drive better results. Integrating multiple channels is a powerful strategy in direct marketing, and this session drove home the best ways to get the most out of integrated efforts. A presentation by Mondi, a provider of packaging and paper products, on a new paper series they’ve developed along with an interesting and informative overview of their company. Mondi’s new sheets look promising, and we will be testing them in the near future. A breakout session on Screen’s new Truepress Jet520 HD digital press, hosted as part of the Direct Mail Track. The color gamut and print quality of their new technology was impressive, and their spirit of innovation is an exciting sign for the future of mail design and production. In addition, I was privileged to present a case study on IWCO Direct’s implementation of the Messagepoint dynamic content management tool. Using this tool, we’ve created an environment that allows data to drive reusable content and assets by combining logic and wireframes to generate print output. As the case study pointed out, every tool we utilize, including those used in content management, strengthens our production capabilities and our clients’ campaigns. Workflow continued to be a hot topic at the 2016 Inkjet Summit, with a strong focus on streamlining processes to get input files ready to print more efficiently. Selling the value of inkjet versus conventional print was a focus of many conversations, with an emphasis on leveraging the 1:1 aspect of digital print through variable messaging and dynamic content features. This is an area in which conventional print has historically struggled. And while no single technology stood head-and-shoulders above the rest, it’s obvious the technology is improving across the board. Print quality and color gamut have improved across the new generation of presses. There are also exciting improvements in finishing and inspection system add-on technologies, such as what Videk provides. The Summit’s discourse also highlighted some of the challenges the printing industry now faces. Print providers are still learning how to use data to unleash the marketing power of digital technology. This is an issue of both education as well as workflow. Without the knowledge of how to use data effectively, marketers simply can’t utilize the technology to its maximum effectiveness. The Inkjet Summit continues to be a worthwhile conference with strong content, knowledgeable expert presentations and excellent networking opportunities every year. 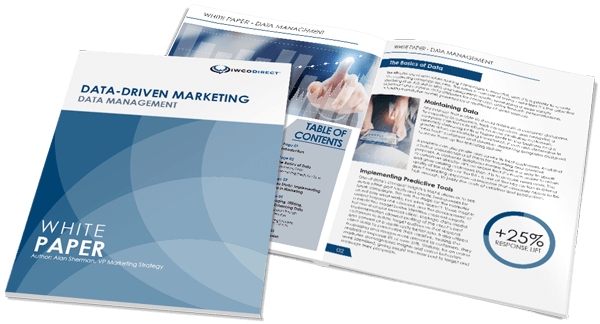 It reinforces the unique relationship direct marketing has with the print industry, and provides insight into crafting the best and most effective campaigns with the right combination of expertise and tools. Contact your IWCO Direct account team or me to find out how IWCO Direct’s advanced production platform, and the experts behind it, can drive better results for your direct marketing campaigns.